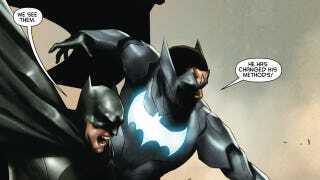 Check out a five-page preview of DC Comics' Batwing, guest-starring The Dark Knight himself! Courtesy of DC Comics, here's an exclusive sneak peek at the next issue of Batwing, starring David Zavimbe, Batman Incorporated's representative from the Democratic Republic of Congo. In this five-page preview, Batwing teams up with Batman to thwart the agents of the villain Massacre — the heroes use wits, technology, and a panoply of punches. The mystery of the Kingdom, Africa's first and last Super Hero team, continues. When their former headquarters is opened to the public, its American benefactor, Bruce Wayne, is on hand. Will the villainous Massacre, who's been murdering the lost heroes, stop by for the grand opening? If he does, it will be up to Batman and Batwing to stop him. It's a battle of the bats!